Every so often, breaking news brings China’s left-behind children to the forefront of public attention. Recent reports of left-behind child orphans being adopted and trained by martial arts clubs led to public debate over the fate of rural children growing up alone, as well as the shocking finding from a survey late last year in which 11.9% of left-behind children said that their parents working away in cities were dead. But perhaps none have captured the heart of the nation more vividly than the images of so-called “Ice Boy,” a left-behind child called Wang Fuman from a village in China’s Yunnan province. 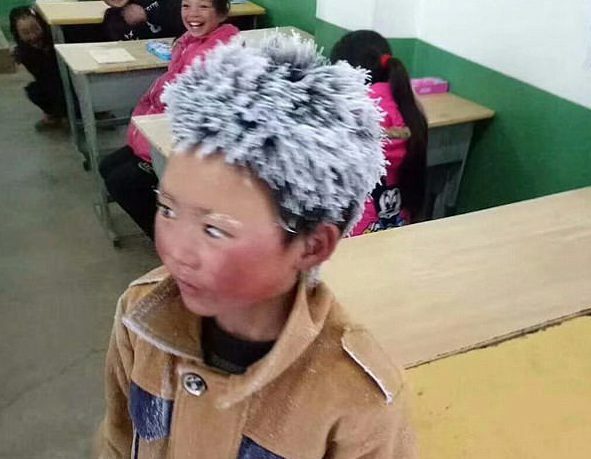 Images of 8-year-old Wang Fuman, nicknamed “Ice Boy” online, went viral when his teacher posted a photo of his frozen hair caused by the hour-long walk to his village school in Yunnan in the freezing cold. 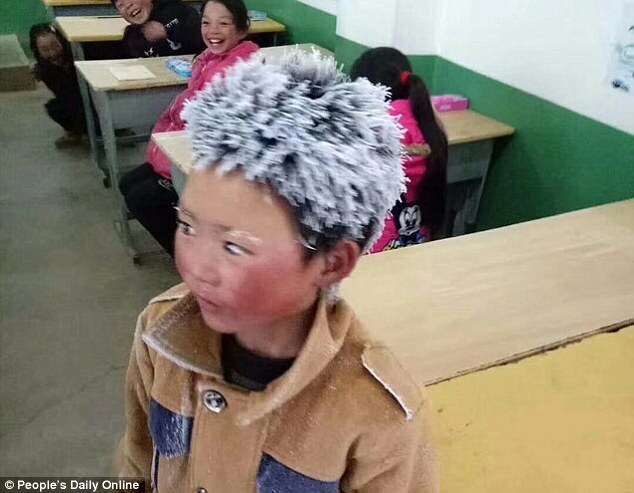 Wang and his frost covered hair has given a face and a name to a story shared by millions of others in rural China; children that have been left by their migrant workers parents who moved to the cities to earn a living. In 2013, the All China Women’s Federation (ACWF) released a report estimating the number of left-behind children living in China at to be 61 million, a figure that represented 38% of all children in China. These children remain in their home villages, usually under the care of elderly grandparents, while their parents work hundreds of miles away for prolonged periods of time. With a lack of jobs and low wages in rural areas of China, for migrant parents, leaving their children behind is a difficult choice often made out of economic necessity. Based on the definition from the ACWF, a left-behind child is anyone aged 18 or under who have one or both parents living away from home for a period longer than 6 months. Among the 61 million children in China that fall under this definition, an estimated 75% under the age of six are not living with either parent, compared with 47% of those aged between 15 and 17 (2005 Bi-consensus). In more recent years, renewed discussions around the definition of left-behind have included children under 16 years of age with both parents living away. 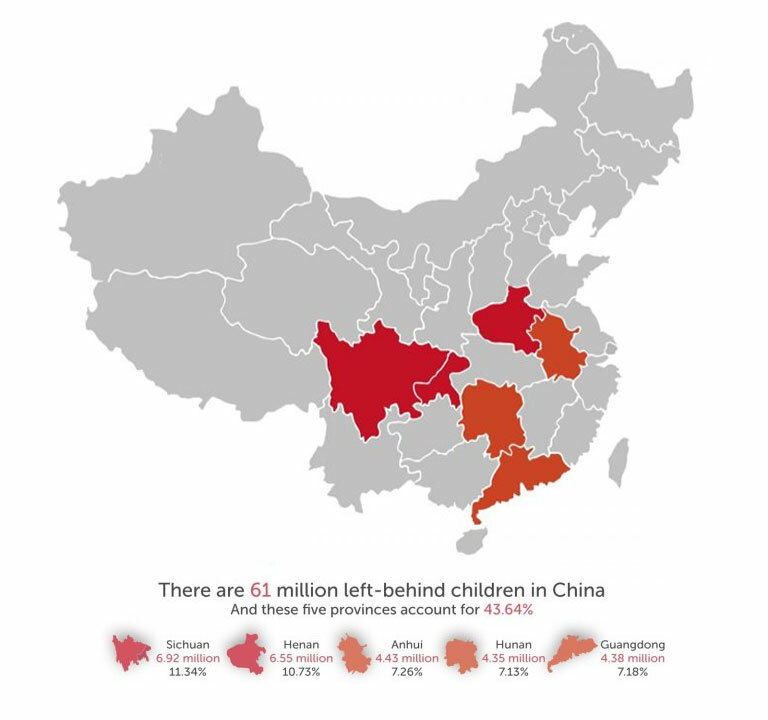 The updated figure was released by the Ministry of Civil Affairs (MCA) in 2016 suggested the number of left-behind children has since dropped to 9 million (see our previous article China’s Left-Behind Children Disappear for more on this). Despite such huge disparities in figures, the issue is one that affects millions of rural children across China where social disruption in the countryside has scattered families far and wide. Five provinces in China are home to 43% of all left-behind children – Sichuan, Henan, Anhui, Hunan, and Guangdong. Based on the ACWF statistics, Sichuan is home to the largest number, accounting for 6.92 million (11.34%). Reasons for this stem from Sichuan’s large rural population, with many young people in the countryside leaving the area to seek opportunities elsewhere. Lack of employment in rural areas across these five provinces also causes the age demographics to be strongly skewed towards the elderly and the very young. Following the public response to Ice Boy, which reignited the poverty debate in China and led to 300,000 yuan (£33,690/$46,638) raised by the public in just five days, the story also caught the attention of Alibaba’s Jack Ma who called for entrepreneurs, the government, and other stakeholders to join forces in accelerating reform of the rural school system in China. Articulated by Ma, the idea of reform that has long been underway in rural China is built on the premise of merging smaller village schools, like the one Wang Fuman attends, into larger boarding schools in which children can be looked after during the week, and sent home to grandparents at the weekends, removing the long daily hike to school and allowing for increased safety and resources to be pooled. However, within this model of restructuring rural schools many challenges exist, particularly the lack of qualified rural school teachers. 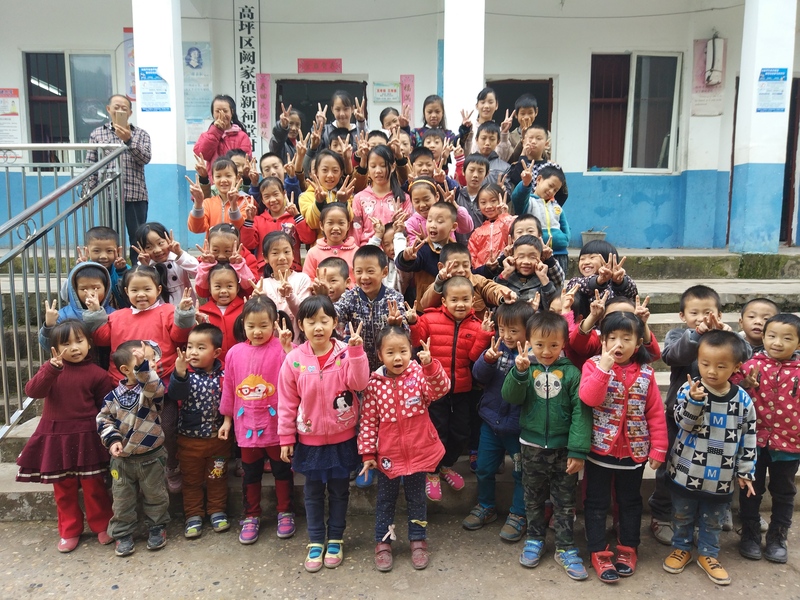 Rural teachers in China are often older, poorly trained and underpaid, and have a large number of students in each class, sometimes reaching up to 90 students to every one teacher. As such, the turnover rate is high. Furthermore, one report suggests that the success of such boarding schools in terms of how they provide care for the students is questionable, with few able to afford staff that can look after the children and manage the dorms, while others highlighting the importance of parental care above all. Xincitang school is run by Mr. Chen and his wife, both in their sixties. With only the two of them and 60 children attending the primary school, it is run more like a day-care center without structured classes and timetables and relies heavily on local government funding. But rural education reform is only part of the challenge. Disparities in health care and social services between city and countryside remain stark. Many villages lack any working-age demographic at all, leaving behind only children and the elderly. Economic opportunities that draw parents and the working age population back to the countryside play a key role in bringing rural families back together again and improving the emotional well-being of rural children. In our recent interviews with migrant worker parents who have left behind children, we heard signs of parents looking for ways to move closer to home. However, this is currently happening at a very slow rate due to the lower salaries in rural China. Although trends show this gap is closing along with regional economic development towards interior provinces, it will take time before opportunities for parents to find work in their hometowns outweigh those in the cities. With the Chinese government’s plan to end rural poverty by 2020 fast approaching, solving the left-behind children issue will play a vital role in its success. While researchers point to the simplicity of rural boarding school reforms, it brought the issue to an audience of social entrepreneurs, public, and government attention, reigniting the debate on poverty in rural China, and ways to solve the imbalance. Strategic sustainability is not only about the environment; it is about individuals and society as well. We live in an urban age, but the future course of our world is intertwined with the fate of the rural, and nowhere is this more apparent than in China. Supporting left-behind children is an opportunity for the private sector to join forces with authorities to provide collective solutions. There are many organizations already working to support left-behind children, through education, online volunteering, parent training for migrant employees, and rural development projects to create more local jobs. For concerned stakeholders, particularly who are looking at China’s interior for project sites, understanding this trend and seeing it as an opportunity is now key. Creating summer camps for the children of factory workers, providing compensation and benefits packages that are more aligned to families, and developing programs to retain and stabilize labor, are providing firms with tangible advantages (see our previous post on migrant worker well-being), a trend that for many industries will over time become the new baseline. With Chinese New Year approaching, the time of year when almost all urban migrants return home, it remains to be seen how many individuals choose to return to cities like Shanghai or look for opportunities closer to family and friends. To learn more about the challenges that migrants face, and opportunities to align with these challenges, take a look at our Hope and Opportunity Report focused on the wants, needs, and challenges of migrants. To learn how your company can support migrant workers and their children, contact us at rose@coresponsibility.com. Tags: China, economics, education, labor, left-behind children, Migrants, migration, urbanization.